If you’re the type that looks forward to the day this lil’ experiment called human civilization comes to an end, then I have some good news for you. 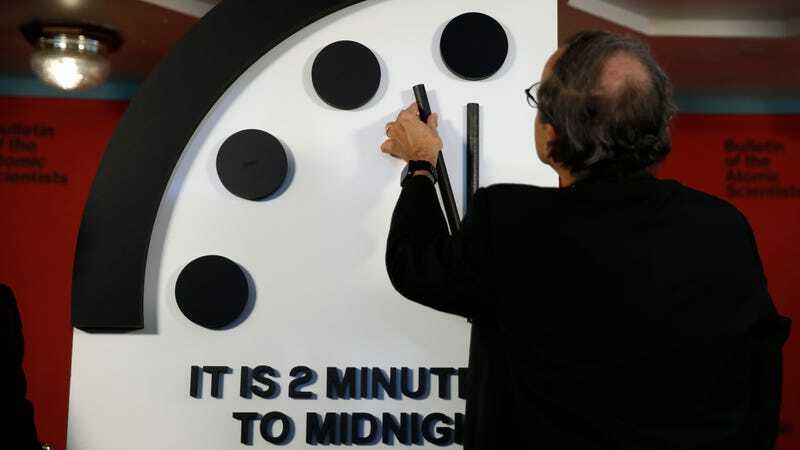 The soothsayers at the Bulletin of the Atomic Scientists have bumped the doomsday clock 30 second closer to midnight. We’re now two minutes from the end of the world as we know it, thanks to the growing threat of climate change and nuclear holocaust, and growing technological threats like cyberwar and the fracturing of our shared reality. “There are so many [problems] from which to choose,” Sharon Squassoni, a military strategy expert and member of the Bulletin’s Science and Security Board, said with a little laugh that I’ll hear in my head as the nuclear fallout fills my lungs. The clock was originally created in 1947 because of heightened concerns about nuclear war. The only time its been this close to midnight was 1953. “The achievement of a thermonuclear explosion by the Soviet Union, following on the heels of the development of ‘thermonuclear devices’ in America, means that the time, dreaded by scientists since 1945, when each major nation will hold the power of destroying, at will, the urban civilization of any other nation, is close at hand,” the scientists wrote at the time. Now we’re on the brink again, with feckless leaders in North Korea and the U.S. raising the risk of nuclear war to a level not seen since the Cold War ended. But it’s not just nukes that matter. Starting in 2007, climate change was added to clock considerations because it poses a growing existential threat to humanity. And the clock’s new position reflects that, after a year of horrific weather disasters, near-record heat, and increasingly clear signs we’re pushing the climate into a new state. It also reflects the fact that both these and other problems are only one part of the equation. The institutions that could help us deal with all these issues are in decline right when we need them the most. When it comes to climate change, that’s never been clearer. The U.S., which is the world’s largest historical emitter, has sidestepped any and all climate action under the Trump administration. Institutions charged with upholding climate and environmental rules, like the Environmental Protection Agency, have been stocked with climate deniers and shunned scientific advice. The head of the Energy Department made a ill-advised play to prop up the coal industry, the dirtiest fossil fuel, and said U.S. fossil fuels equal freedom. And then there’s the president himself. He’s yet to appoint a science advisor, made the U.S. a pariah by pulling out of the Paris Agreement, and tweeted some really stupid things about climate change. Oh, and he’s instituted policies that will slow the adoption of renewable energy. While Kartha noted that other nations have “reaffirmed their commitment to global climate cooperation,” many nations are joining the U.S. in failing to take meaningful actions to reduce carbon emissions. The world’s carbon emissions rose last year despite every world leader outside of Donald Trump knowing we need to get a handle on them very soon. The longer humanity takes to get its act together, the more dangerous climate change will become with more intense heat waves, higher storm surges and rising tides of migrants leaving their climate-shocked homes for more stable locales. That also means that incredibly risky propositions, like geoengineering the atmosphere in an attempt to cool the planet, could become more enticing to policymakers. Because a few rogue states could geoengineer the planet, the corrosion of institutions and attention paid to science is even more toxic and concerning. That’s why the clockmakers include it regularly now. It’s also why experts surveyed by the World Economic Forum recently named our failure to mitigate and adapt to climate change as one the biggest (and more ominously, one of the most likely) existential threats to humanity. Despite the fact that we live in extremely dangerous times, the scientists in charge of the clock said there is hope. The clock has been wound backwards before, in the wake of the Cold War or during times when nuclear superpowers expressed interest in not mutually assuring destruction. The scientists argue that civil society should turn the screws on government to reduce carbon emissions and push for even more ambitious climate action than what the Paris Agreement calls for. That sounds like a more fruitful plan than huddling in a bunker. Could a Rogue State Use Geoengineering to Mess With Hurricanes?